This British Vickers MkII Light Tank at the Tank Museum, Bovington, England. The Vickers MkII Light Tank had a two man crew and was meant for Colonial policing deployment not the front line of a modern battle. The Vickers MkII Light Tank at the Tank Museum, Bovington was originally painted in desert camouflage. This Vicker's Armstrong Light Tank MkIIA is on show at the Tank Museum, Linsay Road, Bovington, Dorset. The nearest train station is Wool Railway Station. You can walk the 2 miles to the Museum but there are not pavements along the country road and if you are travelling with children it can be dangerous. It takes 45 minutes by foot. There is an irregular bus service from Wool Station that will get you to the museum but they only come once an hour in the morning starting after 9.30. 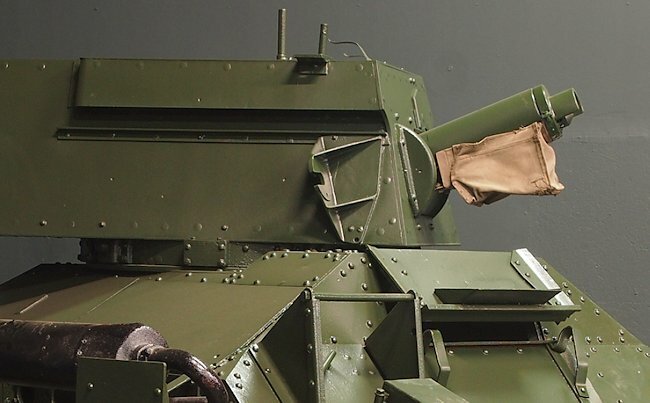 The Vickers MkII light tanks was powered by a Rolls-Royce 6 cylinder petrol engine that produced 66 hp. The tank had a maximum road speed of 30 mph (48 km/h) and a off road speed of 21 mph (30 km/h). It had a range of around 173 miles (279 km) before it needed to refuel. It was armed with a .303 inch (7.7mm) Vickers water cooled machine gun. The two man crew were protected by armour that ranged in thickness form 4 to 12 mm. It weighed 4.5 tons. 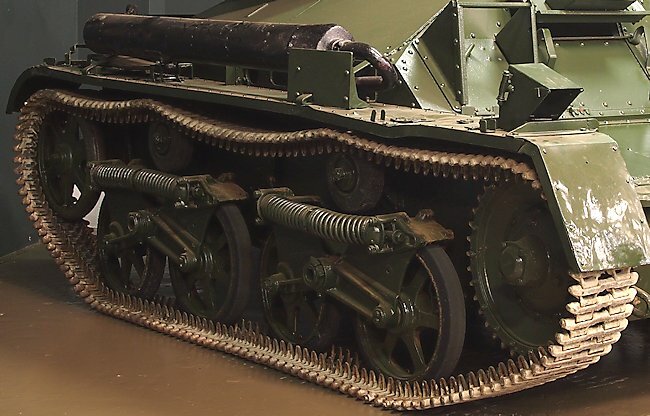 The early Carden-Loyd tankettes were invented by Major Giffard LeQuesne Martel in 1929 for the British Royal Army Corp. With the success of his prototype, and after many modifications, the production for export shifted to Vickers-Armstrong. Besides the numerous customers for this cheap and fast light vehicle, many armed derivatives were built. The development of the turretless versions, which was carried out by the Experimental Mechanized Force unit, became the popular Universal Carrier series, of which over 100,000 were produced. On the other hand, the Royal Tank Corps requested a turret-armed version, in order to test its tactical potential. This led to the development of the Vickers Mk.I Light Tank. 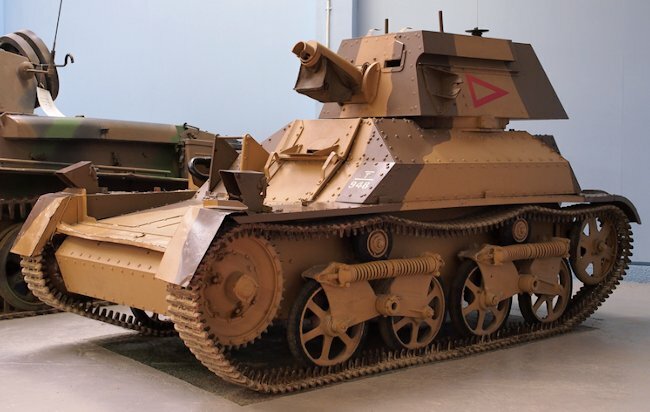 During the dark economical times of the 1930s depression small light tanks were cheaper and easier to maintain, with better standardization, and requiring only two men each. Vickers had the start of a good export business. These small tanks were intended for police duties in the colonies, not front-line action. 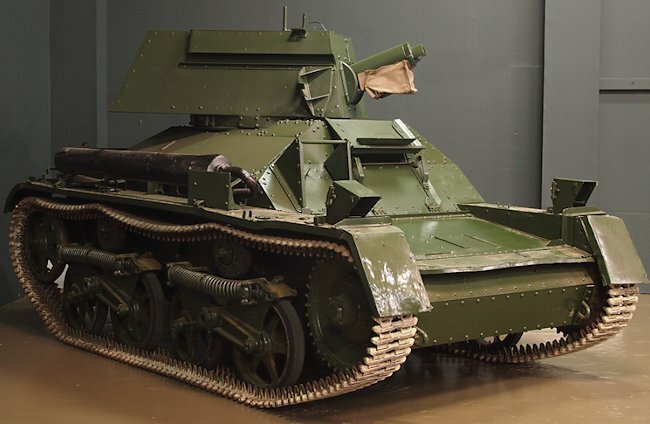 The Vickers Mk.II Light Tank was closely based on the previous Mk.IA, but with many modifications, including a shorter and larger hull and a roomier fighting compartment. It was one of the first vehicles to have Cemented Tank Armour, which allowed thinner, although stronger plating. They also featured a new Rolls-Royce gasoline 6-cylinder engine coupled with a transmission and preselector Wilson gearbox seated on the right hand side of the tank. Consequently, the driver and turret were relocated to the left. The Vickers machine-gun model was a modified pistol grip version, protected with a 10 mm (0.39 in) strong external mantlet, and fed by 4000 rounds. The rectangular turret was large enough to accommodate a radio at the rear. The casemate was sloped, but visibility was somewhat reduced. Production was started by Vickers-Armstrong (16 Mk.II and 21 Mk.IIB) and the Royal Arsenal of Woolwich, which delivered 29 Mark.IIA. These were modified version for service in India. They had a better cooling system, a more powerful Meadows EPT 6-cyl 85 hp engine and a crash gearbox. Many Mk.IIAs and Mk.IIBs remained in India prior to WW2. The Mk.II had no air louvers on the turret sides and a sliding roof hatch. The Mk.IIA had two fuel tanks, air louvers, and a folding hatch with two doors. “Indian pattern” Mk.IIBs were equipped with an extra squared cupola over the turret. Upgrades included anti-bullet splash baffles, Rolls-Royce engine, and dual spring system. 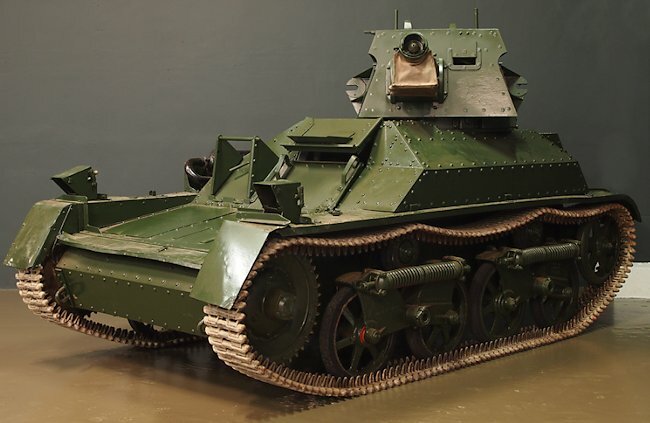 The Vickers MkII Light Tank had a two man crew and was meant for Colonial policing deployment not the front line of a modern battle. By 1941, most Mark IIs were shipped in Eastern Africa to take part in operations against the Italian colonies of Abyssinia and Erythrea. In this 'forgotten' theater of war, these tanks had reasonable success, due to clever tactics in conjunction with Australian infantry squads supported by armored cars, and weak opposition (the Italians mostly had obsolete guns and CV-33 tankettes there). They also fought in Egypt or Libya, at least until 1942, when some replacements arrived. Some were repatriated when the war broke out with Japan, being posted at the Indian eastern border with Birmania. When the Japanese army came close to invade India in 1943, they fought actively with Indian troops in Birmania, but by 1944, all surviving units have been declared obsolete and put in training centers. 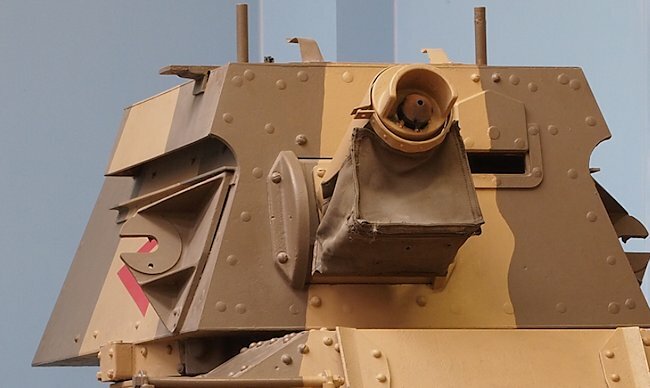 Close up view of the .303 inch (7.7mm) Vickers water cooled machine gun fitted to the Vickers MkII Light Tank. Where can I find other preserved Vickers Mk II Light Tanks?